Dan on the set of his podcast during an interview. So many people were approaching me simply because they recognized me as part of our Special Olympics community, a community that is large and inclusive. One that I am proud and grateful to be part of. Not that celebrity is a goal for those of us with intellectual disabilities, but instead the goal is being seen, accepted, and appreciated by the general community. In other words, being included. I know I am part of this global Special Olympics community because people know my name. I know I’m part of the Special Olympics community because people show confidence in me. They work unified with me. They challenge me to become a better me. And I know I’m part of the Special Olympics community when people countdown to celebrate with me. “Speaking” of me, I’m going to quote a few people in this piece talking about me—not because I want to “blow my own trumpet” but rather because I want to illustrate that the inclusion of me—and all people with intellectual disabilities like me—is having a positive impact, breaking stereotypes and misconceptions, and replacing them with reality. My goal for Special Olympics is that our community gets so inclusive that it encompasses the whole world. Anyone is potentially part of the Special Olympics community. We want the lines to blur between Special Olympics and all the rest of the world. Global inclusion is a pioneering idea that is much needed today in a world that is so divided. As we both celebrate the United Nations’ International Day of Persons with Disabilities with the 2018 theme of “empowering persons with disabilities and ensuring inclusiveness and equality” and countdown to our 2019 Summer World Games in Abu Dhabi, I challenge everyone to up your game For global inclusion. This is an inclusion revolution that everyone from youth, educators, health professionals, policy-makers, employers, entertainers, and content creators can join to include more of those of us with intellectual disabilities. Youth—Please share our #ChooseToInclude movement, join a Unified Sports team, or advocate for Unified programming in your schools. This is an inclusive team and I’m thankful for it. He [Daniel] has given so many people a voice and opportunity to follow their dreams. Inclusion is the way I live my life. Elizabeth from Illinois, a Unified Rhythmic Gymnastics team member. Young people have the power to transform lives. Youth have the power to be unified. Today’s youth are the Unified generation and are the future of Special Olympics. I hope every young person across the globe will join our inclusion revolution and will challenge every person, regardless of boundaries, religion, politics, race, or ability level to advocate for Unified programs within their schools. I hope that every school across the world will incorporate Unified programs into their school’s curriculum. I challenge the youth today to up their game for global inclusion. Educators—Please advocate for Unified programs in your schools and make inclusion a priority. Teach the value of inclusion to the next generation of leaders, a unified generation. I challenge every educator to make inclusion a priority in their curriculum. When educators from early childhood to elementary to middle schools to high schools and universities teach the value of inclusion, we can break down barriers and truly heal a divided world. None of my students since I began teaching has been more passionate about making a difference by the gifts that God has given them than Dan. And as his former professor I can say I am truly proud that not only has he become a clear, strong, and passionate voice for a group whose voices deserve and need to be heard but that he’s also become a conduit for the voices of others within the special needs community. And let me tell you that’s journalism. John W. Fountain, award-winning columnist, author, and journalism professor. I challenge educators to up their game for global inclusion. Health professionals & Policy-makers—Please make inclusive healthcare, clinical practice, curricula, and policies the standard across the world. Get started today by volunteering with Healthy Athletes. Health professionals answer the calling to take care of all of us. Our doctors and policy-makers can to choose to include by pushing for the basic human right to healthcare. I challenge every health professional and policy-maker to advocate for inclusive healthcare and make inclusive policies the standard across the world. Once you get started by volunteering with our Healthy Athletes program you’ll see firsthand the power that inclusion has to change lives. Health professionals and policy-makers will see the unconditional love, joy, and determination that those of us with intellectual disabilities bring to the world. Healthcare should be universal. A patient’s pre-existing health conditions, personal beliefs, backgrounds, disabilities and abilities should not be a factor except to develop the best health plan for them as an individual. I challenge every health professional and policy-maker to up their game for global inclusion. Employers—Please hire people with intellectual disabilities. We make great employees at every level of your organization and businesses. This is simple idea that should not be seen as charity. It should not be an act of charity to hire us. It’s the right business decision. Employers have the ability, when they hire those of us with intellectual disabilities, to treat us just like anyone else—as truly capable of working alongside our colleagues without disabilities. The appalling unemployment rate for those of us with intellectual disabilities needs to change. Campaigns like Best Buddies International’s “I’m In to Hire” campaign, their Jobs program, Creative Spirit’s job placements, and Bitty & Beau’s Coffee aspire to change the world of work. Similarly to these work initiatives, my goal through my columns and podcasts, heard by thousands of global viewers, is to empower the voices of those of us with special needs so the world can better incorporate our abilities. An honor to have you [Daniel] leading the Inclusion Revolution. Showing people giftedness, strength, compassion, humor, and always proving that we all deserve a place. … It takes a lot of determination, persistence. But the world, people notice and you’re teaching people powerful lessons about the best of humanity. I challenge every organization, company, and business across the globe to hire at least one person with disabilities in their workforce. Within the coming year of 2019, I challenge everyone to up their game for global inclusion by hiring at least one person with intellectual disabilities. Entertainment, Pop Culture, and Content Creators—Please include more people with intellectual disabilities in front of and behind the scenes. Entertainment producers, pop culture celebrities, and content creators need to see that those of us with disabilities bring extraordinary gifts in front of and behind the camera or microphone. Ten years ago, I created Special Chronicles, a nonprofit platform giving a voice to my fellow Special Olympics athletes and to others with disabilities. Through podcasts, stories, and public speaking, I am helping create understanding for each of us. In giving my fellow Special Olympics athlete leaders opportunities to present their stories, I’ve motivated them to communicate their stories to a worldwide audience. Countless viewers and contributors have told me that they have been empowered to pursue their own dreams. Viewers have told me that they see the unconditional love, gifts, joy, acceptance, and inclusion that those of us with intellectual disabilities bring to people everywhere. Those of us with disabilities make up the largest minority group in the United States—but we are the least seen in the entertainment, pop culture, and digital content media platforms. We can look to a few examples to learn how to include those of us with intellectual disabilities in front of and behind the camera or microphone. Within the Entertainment platforms, I wholeheartedly recommend you watch popular shows like Born This Way (A&E), Speechless (ABC), The Good Doctor (ABC), 9-1-1 (Fox), and Kelly’s Hollywood (produced by Brian Donovan). Within popular culture, I highly recommend you follow celebrities like actor John C. McGinley (@JohnCMcGinley), Olympic swimmer & our Global Ambassador Michael Phelps (@MichaelPhelps), actor Micah Fowler (@MicahDFowler), Jon Murray and Bunim-Murray Productions, and journalist Maria Shriver (@MariaShriver). Within digital content platforms, I wholeheartedly recommend you follow my SpecialChronicles.com platform. I also recommend you follow a few of my fellow Special Olympics athlete leaders who also contribute to Special Chronicles: Daina (SO Wisconsin) and Jose (SO Illinois). And, finally a few of my fellow Sargent Shriver International Global Messengers such as Hanna (SO Colorado), Emanuelle (SO Brazil), and Brina (SO Philippines). Daniel’s unique in that he’s one of the few people with a disability who is a journalist and who is bringing important issues to everyone, I think that it’s important as we go forward to have people of all abilities both in front of and behind the camera. That’s certainly what I’m working towards at my company and I hope others are also doing that. This is why I challenge every entertainment producer, actor, celebrity, and content creator to up their game for global inclusion. Just as in the past decade I’ve chronicled my fellow Special Olympics athletes’ journeys as a study in empowerment, I hope you will join us in doing more to advance a world of full inclusion for me and for you too. Daniel Smrokowski was born three-and-a-third months premature and was diagnosed with learning disabilities and a severe language disorder. He is an award-winning veteran podcaster, columnist, and an acclaimed advocate telling disability stories. Daniel is the founder of Special Chronicles, a nonprofit media platform that gives respect and voice to people with special needs. 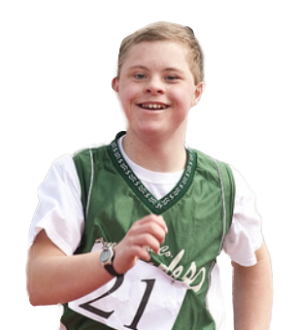 Daniel is also involved as an athlete, global messenger, & board member with Special Olympics Illinois. 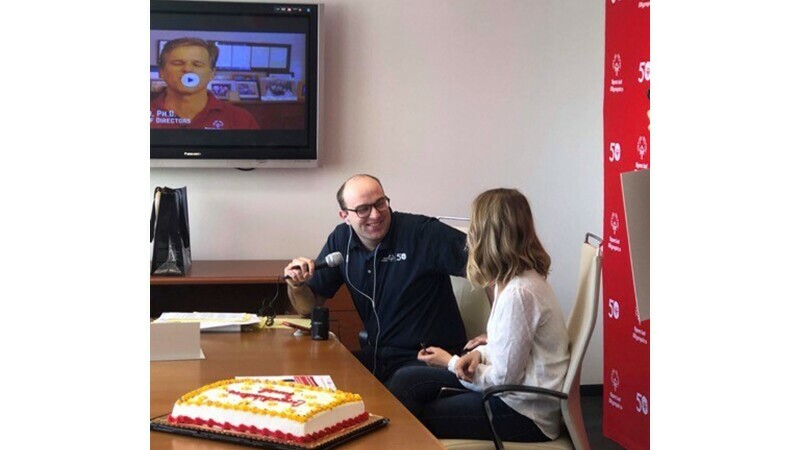 Daniel is currently a Sargent Shriver International Global Messenger with Special Olympics, traveling the world sharing his story and encouraging folks to join the Inclusion Revolution Movement on behalf of his fellow 5.6 million Special Olympics athletes. Come join us at www.SpecialChronicles.com.